You see those men in the yellow hats? They are some of the most important people in this world to me. They are part of my patch-work family. Not the one I was born into, but the one I've created. I call them my Uncles, though we do not share the same blood. I only met them when I moved across the country to attend school. But they quickly took me into their group and watched over me and protected me whenever they were in town. They came to D.C. often in pairs or groups. At least twice a year, they'd gather all together. One of those times was Veteran's Day. 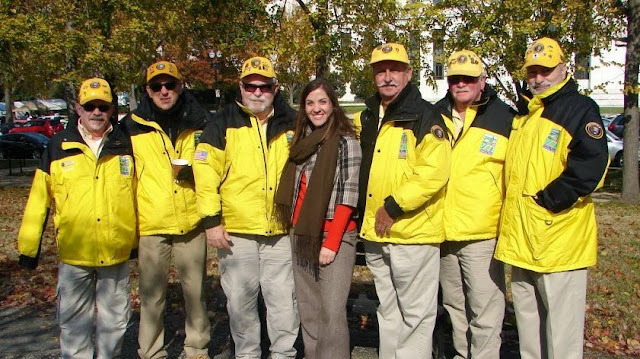 These men are all Vietnam Veterans who continue to sacrifice their time and their money to volunteer at the Vietnam Veteran's Memorial Wall. Mama wrote all about these men and what they mean to our family over at the Vietnam Veteran's Memorial Fund website, go read what she has to say. She tells the story much better than I can. I didn't join them in D.C. this year, but today I am honoring these men, my uncles, and those who have and continue to serve their country. Welcome home and happy Veteran's Day!